WHAT: They might not face dragons or evil witches, but children do face dangers when they’re riding in cars. That’s why it’s so important for parents to make sure their kids are in the right car seat, so if they are involved in a crash, the story is much more likely to have a happy ending. During Child Passenger Safety Week, child passenger safety technicians from around the state are partnering with the Salt Lake County Library to help parents make sure their kids are riding safely. To highlight the partnership, an officer from West Jordan Police Department will read a car seat-themed book during the Jordan Branch baby and toddler storytime. Zilhgan Boone was involved in a chain reaction crash last week in Taylorsville. Fortunately, his infant daughter was secured in a car seat and escaped the crash with no injuries. He will be present at the storytime to share his daughter’s story. Child Passenger Safety Week runs September 17-23. Throughout the week, certified safety technicians will be offering free car seat inspections statewide, further providing parents and caregivers an opportunity to better understand which car seat is appropriate for their children and how to install it correctly. 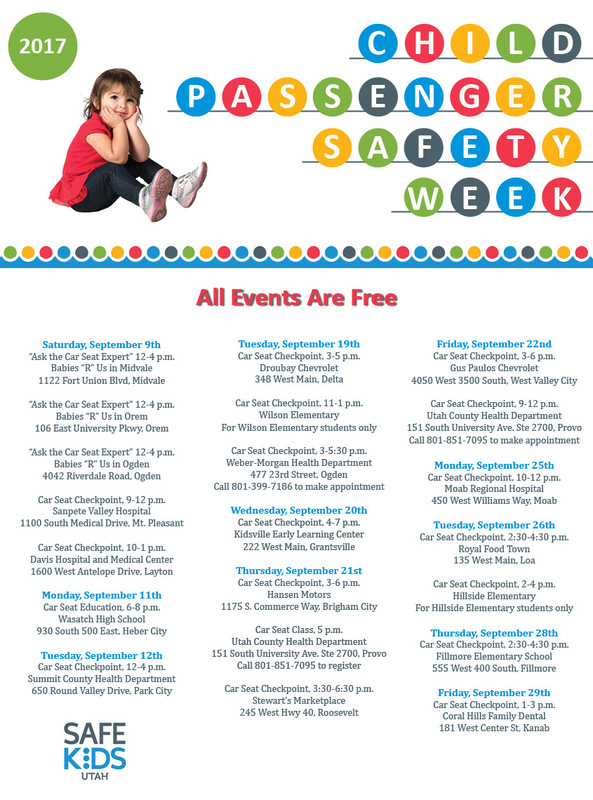 Visit clickit.utah.gov for a list of events throughout Utah or to find a car seat inspection station near you. WHEN: Thursday, September 21, 2017 10:15 a.m.
WHY: Crash data from Utah in 2015 shows that the older a child the less likely they were using a child safety seat. While over 88% of children ages 0 and 1 years were in a child safety seat, only 75% of 4-year-olds, 49% of 6-year-olds, and 13% of 8-year-olds were in a child safety seat. In passenger cars, child safety seats reduce the risk of fatal injury by 71 percent for infants and by 54 percent for toddlers. For infants and toddlers in light trucks, the corresponding reductions were 58 percent and 59 percent, respectively. Most parents are confident they have correctly installed their child’s car seat, but in most cases (59 percent) the seat has not been installed correctly. Free car seat checks are going on this week and next.